Have you had enough of diets, calorie counting and depriving yourself of your favourite foods? This is the guide that’s helping people worldwide to achieve their health & weight loss goals. Live a happier, healthier life while still maintaining your sanity and feeling like a “normal” person! 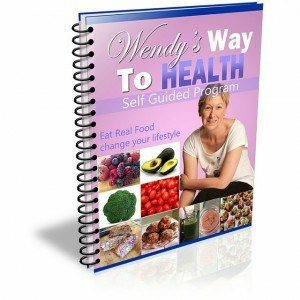 The Wendy’s Way program e-Guide is a step by step walk through that you can do in the convenience of your own home, at your own pace. All of the forms, reports and fact sheets necessary for your success are also included. And if you need extra help & support, just email: wendy@wendyswaytohealth.com for access to the private forum. I would recommend this guide for anyone who wants a simple yet detailed approach to eat better, exercise, and stay healthy long term. It is filled with easy to implement, common sense tips and has all of the forms you need to keep track of your progress. The best part is that you don’t have to try to do it all at once, or keep up with anyone else. I’m just making little changes here and there, but I feel so much better already. I’ve dropped two dress sizes so far following Wendy’s program. I still have got a way to go, but now I’m not stressing about a time frame anymore because I’m not on a diet any more. I have learned how to change my habits and make better choices than I used to. It will take as long as it takes, and I am learning what works best for me as I go. Thank you!